Call it the “Serial” effect. Or maybe “the podcast revolution.” Or, better yet, the “golden age of audio.” Whatever you call it, it’s happening right now, before our eyes. Well, technically, in our ears. Once considered a niche medium, podcasts are making it into the mainstream, engaging audiences on a level that far surpasses more established mass media. Manoush Zomorodi, host of WNYC’s newly-renamed Note to Self (formerly called New Tech City), recently led a conversation at Internet Week New York with some of the most notable podcast hosts and producers about building followings into communities and businesses. 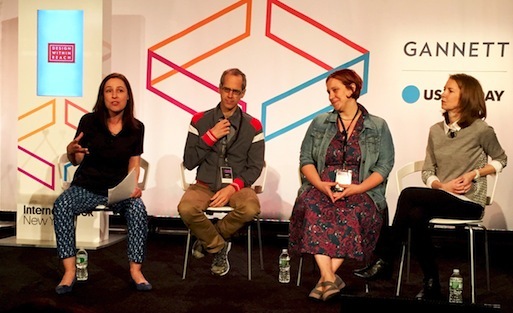 The audio powerhouse panel featured Alex Blumberg, co-founder and CEO of Gimlet Media; Ellen Horne, executive producer, WNYC’s Radiolab; and Gretchen Rubin, blogger, podcaster, and author of The Happiness Project. Blumberg is no stranger to the podcasting world. Before launching Gimlet Media last year, he co-hosted the popular NPR business podcast, Planet Money, as well as produced for This American Life from 1999 to 2014. Dubbed “the premier media company focused on narrative podcast,” Gimlet Media now has three shows under its belt: StartUp, Reply All, and the newly-launched, Mystery Show. Gimlet Media now has three popular podcasts. Heralded as the ‘most intimate medium,’ Blumberg viewed the burgeoning podcast industry as a commercial opportunity, not only in terms of the increasing number of podcast listeners, but also their engagement with the medium. It was, he says, the perfect moment to create “audio on demand.” And the numbers confirm his theory. According to Edison Research, about 46 million Americans 12+ have listened to at least one podcast in the last month. Like Blumberg, Gretchen Rubin wanted to engage more deeply with her audience. She was approached by and subsequently joined Slate’s network of podcasts, Panoply, to start a show based on her best-selling book (and accompanying blog), The Happiness Project. This surge in popularity, coupled with the medium’s intimate nature, has helped podcasts monetize their audiences, securing revenue directly from listeners in addition to their existing advertising and sponsorship dollars. For example, Marc Maron has said 10% of his audience pays between $1.99 and $8.99 for a premium membership to his WTF podcast. Podcast listeners aren’t passive fans; they engage with their favorite shows. According to Horne, audience engagement is at an all-time high thanks to the creative strategies employed by podcasts like Radiolab. The popular podcast has cleverly engaged audiences via its underwriting and mobile app. Horne and company wanted to make the show’s credits a “tune in” instead of “tune out” moment. So, they decided to transform the underwriting into a character on the show by recruiting listeners to read the podcast’s sponsorship credits. “The listeners are listening to each other and engaging with each other,” Horne said. Radiolab further engaged its audience through its mobile app coinciding with the episode “Things,” which investigated the objects around us and their power to move us. Through the app, listeners can record and contribute to the show. For this episode, Radiolab invited them to destroy something of value. Listeners responded by setting objects, like letters, on fire and sending the recordings via the Radiolab app. “Bored and Brilliant” mobilized over 20,000 active participants. Zomorodi experienced a similar engagement with her audience when the formerly-named New Tech City launched “Bored and Brilliant,” which mobilized over 20,000 active participants. The project uses a week of challenges to help listeners detach from their phones and spend more time thinking creatively. More recently, New Tech City invited its listeners to help rename the podcast. Over 800 suggestions were submitted; the show just revealed the winning name, Note to Self, this morning. “Audiences feel the connection, and put in their time, energy, and maybe even money,” Zomorodi said. With so much out there, the panelists agreed that the podcast discovery process can be difficult and, though there’s a lot of noise, it’s possible to break through the clutter. For Horne, the focus should be on quality; Radiolab first and foremost strives to make the best content possible. Blumberg agreed, noting podcasts need to understand what makes them stand out in this new ‘enthusiasm economy’ and then focus on that thing. Plus, he says it doesn’t hurt to get your podcast featured on another podcast, like Tim Ferris whose ad on StartUp helped his show get traction. Listeners are always in the market for new podcasts, and it’s time for the next big podcast to be discovered.